StopTech Big Brake Kit is designed for NASA's Camaro-Mustang Challenge race series. CMC racers are rules-limited as to the extent of brake system upgrades. 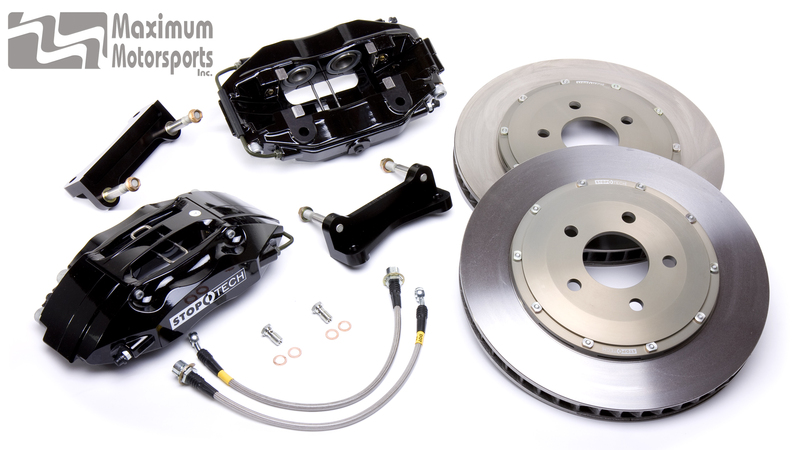 This StopTech kit features 4-piston ST-40 calipers with 13" plain rotors. Directly bolts on to 1994-2004 Mustang spindles. Fits 1979-1993 Mustangs that have the required modifications (see below). Complete kit includes ST-40 4-piston calipers with anodized aluminum differential-bore pistons, along with StopTech's patented bolt-in stiffening bridge, 13" (332mm) plain-surface rotors, braided stainless-steel hoses for the Fox chassis, and all required brackets and hardware. Brake pads not included; Hawk HB-141 pads fit the ST-40 caliper. You'll need brake fluid, so let MM supply it. Your choice! Important: Check for clearance to your wheels with this required wheel clearance drawing. Sideways clearance to the spokes is a more likely interference point than diameter. SN95 spindles. MM has several Tech pages about spindles. Rear disc brakes. 1994-2004 Cobra is recommended. Appropriate master cylinder: 1" bore with 1994-2004 Cobra rear brakes. See the Fitment tab for important notes about hose fitment. Please refer to our expanded information about the above-listed modifications required for installation of SN95 based Big Brake Kits on a Fox Mustang to ensure best results. The ST-40 series caliper is anodized and then painted black to minimize color changes from the extreme heat encountered when racing. The proprietary AeroHats are MIL-spec anodized to resist fading and discoloration at race temperatures. Rotors feature a 2-piece, full-floating design with additional StopTech "Max Float Hardware" that allows the disc maximum movement in both axial and radial directions-more than the street kits allow. Belling of the cast iron rotor is lessened, reducing stress cracking. Rotors are plain (not slotted or drilled) as per NASA's CMC rules. Brake pads are not included, to allow your choice of pad compounds. Hawk HB-141 pads fit the ST-40 caliper. StopTech brakes are a proven winner in NASA's CMC and American Iron race series. StopTech's CMC kit provides awesome stopping power and shorter stopping distances. Known for engineering advances in caliper, rotor, hat, and hose design, StopTech produces optimized systems for the Mustang that provide the shortest stopping distances possible. The advanced brake balance gives a firmer brake pedal, less pedal travel, and superior brake modulation. Increased heat capacity from 13"-by-1.25"-thick, 2-piece AeroRotors allows harder braking stop after stop, with reduced chance of fade. StopTech ST-40 series calipers feature a patented stiffening bridge, and are anodized and painted black to minimize color change caused by high temperatures for a durable, great look. Machined billet aluminum rotor hats are MIL-spec anodized for long-lasting color that resists fading and discoloration from heat. "Max Float" hardware provides full-floating discs that reduce pad knock-back. Includes braided stainless-steel brake hoses to reduce system compliance, providing a firmer and more consistent pedal feel. StopTech has mastered the engineering of increasing heat capacity and reducing compliance without upsetting the Mustang's front-to-rear brake torque ratio. The company's proprietary Balanced Brake Upgrade design philosophy precisely splits the front and rear braking proportions while considering vehicle weight transfer during braking. Using caliper piston sizes specifically chosen for each Mustang application produces optimal brake balance. StopTech's CMC Brake Kit includes forged, 2-piece ST-40 calipers; large, 2-piece, full-floating AeroRotors; stainless-steel braided brake lines; and application-specific caliper brackets. Unique bolt-in bridge greatly stiffens the caliper, improving pedal feel and modulation. 4-piston differential bore design distributes the clamping force over the length of each pad evenly, boosting braking ability and pad life. Hard anodized and then painted black to reduce color change from heat. 1.25" (32mm) thick rotors are thicker than stock, increasing thermal capacity. CMC rotors are plain, not slotted or drilled, as per NASA's CMC rules. 2-piece, full-floating design allows the disc to float in both axial and radial directions. Belling of the cast-iron rotor is lessened, which reduces stress cracking. Curved vanes with unique leading and trailing edges increase airflow through the rotor by 80% over straight-vane rotors and by 30% over other curved-vane rotors. The result is a cooler rotor, which improves brake performance. StopTech's unique AeroHat directs air to the outer face of the rotor. This reduces the usually extreme temperature differential between the inner and outer rotor faces, decreasing the outer pad's wear and reducing rotor cracking. MIL-spec anodized CMC aluminum AeroHat minimizes transfer of heat into the wheel hub and bearings while resisting fading and discoloration. 13" rotor and hat assembly weighs only 17.2 lb. Chassis-end fittings configured to fit Fox Mustang hard lines without an adapter fitting. Braided stainless-steel hoses provide quicker response, firmer pedal feel, and easier brake modulation. DOT-compliant hoses feature a unique swiveling end that ensures correct alignment and fitment to the chassis hard line. StopTech manufactures these stainless-steel braided, PTFE-lined, brake hose assemblies. Not included to allow you to choose your preferred compound. Click here for Hawk HB-141 pads. SN95 spindles. Read MM's Tech pages about spindles. For help choosing a master cylinder size, use MM's Technical Services. Hoses in this kit fit 1979-1993 Mustangs with 7/16"-24 tube nuts on the front brake hard lines. 1979-1993 Mustangs are so equipped, EXCEPT the 1979-1981 Mustang chassis that was originally fitted with a 2.3L normally-aspirated engine or 2.8L engine. These Mustangs were originally equipped with extremely small front brake rotors, only 9.3" in diameter, and had front brake hard line fittings on the chassis with tube nuts having 3/8"-24 threads.